In this podcast, Ricardo talks about managing conflicts. Are conflicts always bad? Listen to the answer of this question and know the different types of conflict that can arise during a project. Project Director, Manager, Coordinator or Leader: Who am I? 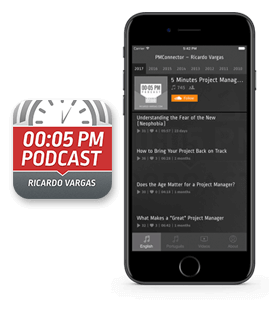 In this podcast, Ricardo raises one question and makes assumptions about why some organizations sometimes provide different titles for whom is responsible for the project management. In this podcast, Ricardo talks about the relationship between the risks and the project scope. Not just the clarity of the scope, but also its amplitude, contribute to the amount of risk that must be managed.